The first large scale map of Devonshire or any other English county. A Map of the County of Devon, with the City & County of Exeter. This is a very rare and highly important 1765 wall map of Devonshire by Benjamin Donn. Drawn in twelve panels, this map covers the entirety of Devonshire or Devon from the English Channel to Barnstaple (Bideford) Bay and from Cornwall to Somerset at a scale of 1 inch to 1 mile. Donn also incorporates large insets of Exeter (showing the college), Plymouth, Plymouth Dock, Stoke Town, and the Isle of Lundy. An elaborate decorative title cartouche with various allegorical elements appears in the lower left quadrant. In 1759 the Society for the Encouragement of the Arts, Manufacturers, and Commerce (since 1847 known as the Royal Society for the Arts), following the suggestion of the Cornish antiquarian William Borlase, offered a £100 award for a large scale one inch to the mile map of any English county. Benjamin Donn, the first to step up to the Borlase's challenge, began work on his map of Devon in 1760. Five years later Donn's extraordinary project reached completion. The Society was awed by the magnitude and detail of Donn's 'accurate, actual survey' and promptly awarded him the £100. 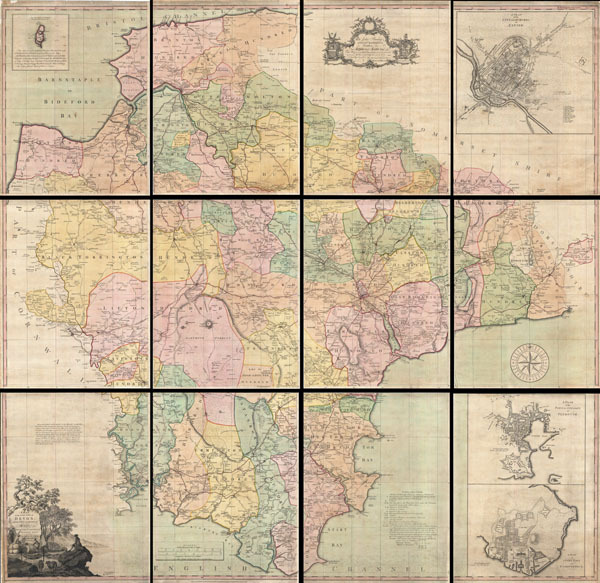 Though the actual work of completing the survey and print the map cost Donn, by his own estimation, nearly £2000, the prestige of issuing the first large scale British county map earned him both robust subsequent sales and the admiration of his peers. Donn's vast map of Devon and Exeter offers a wealth of detail and stands up to extensive study. As the first significant large scale British county map, this remarkable chart introduces a number of cartographic conventions that would become standardized in subsequent county and regional maps. These include Donn's techniques for rendering turnpike roads versus fenced roads versus open roads as well as his innovative iconography relating the identification of farms, cottages, churches, villages, and estates. In addition to the inclusion of typical cartographic features, it also includes such oddities as country inns, pleasure houses, lime kilns, the birthplace of Sr. Walter Raleigh, potato markets, ancient roman ruins, druidic ruins, subterranean passages, mileage, elevation and some 656 gentleman's seats. This map was drawn and surveyed by Benjamin Donn and printed by Thomas Jeffreys in twelve separate but joinable panels. Donn dedicated his map to John Baring of Mount-Radford and Matthew Lee of Ebford, local notables who may have helped Donn finance his survey work. This is a highly decorative and unusual example of this particular map. Most examples of this map appear bound in book format with large centerfolds and outline or no color. This unusual example must have been prepared at a special request and is the only full original color example we have seen. It is recorded that Donn charged 2 extra shillings for binding and 5 extra for coloring, and an additional unknown premium for exceptionally fine full coloring. Further, this example has clearly never been bound or folded and each panel is neatly backed with linen. It is our belief that this is special order variant of the first edition and as such is a unique find. Presents dramatically spaced in a single large frame or in a sequence of narrowly set individual frames. Benjamin Donn (1729 - 1798), sometimes known as Benjamin Donne, was a British cartographer, surveyor, and mathematician active in England during the middle to late 18th century. Born in Bidford, England, Benjamin Donn was the heir to long line of well-respected mathematicians, including his father and older brother, who ran a local school. Early on he developed an interest in surveying and astronomy and from 1749 to 1756 was a regular contributor to the "Gentleman's Diary" where he published accounts of his astronomical observations. In 1768 he was elected librarian of the Bristol Library, and, "in keeping with his taste for the binomial theorem and the book of Euclid, he conceived the idea of converting the establishment into a mathematical academy; but the corporation did not join in his enthusiasm, and students were not invited." Later he established his own private mathematical academy in Bristol near St. Michael's Church. Cartographically, Donn's most significant work is his 1765 large format map of Devonshire, based upon a mile for mile survey he completed at his own expense. This was the first large scale map of any British county and won Donn lasting fame as well as a £100 gratuity from the Royal Society for the Arts. Donn later went on to publish a number of other less significant but popular maps including a pocket map of Bristol, a map of western England, and several nautical charts of the Western Ocean, as well as various mathematical tables. A lifetime of study and dedication to mathematics earned Donne the title of Master of Mechanics to the King, an honorarium he would hold for only a short time. Donn died in 1798. Very good condition. Issued in 12 separate linen backed panels. Minor edge wear. Else very clean. Given size represents the size of the map if fully assembled. Individual panels measure 24 x 19 inches. Rodger, E.,The Large Scale County Maps of the British Isles: 1596-1850, 82. Batten, K. and Bennett, F., Printed Maps of Devon. National Library of Australia, Petherick Reading Room, Rbef CLI 4459.